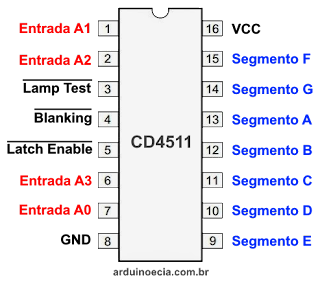 Logo, para formar o número 3 por exemplo, vamos seguir a tabela e enviar para o CD4511 o binário 0011, que vai acender os segmentos A, B, C, D e G do display. 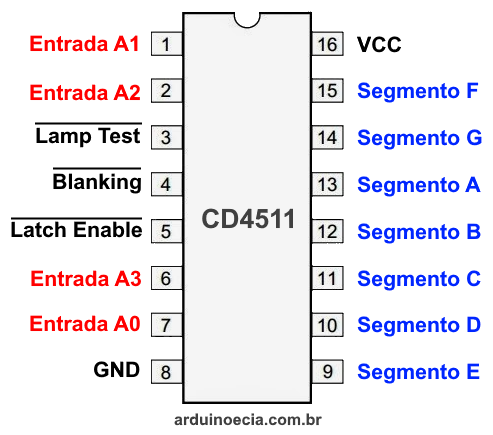 Abaixo temos o esquema de ligação do CD4511 no Arduino, com os pinos digitais 4, 5, 6 e 7 conectados às entradas A0, A1, A2 e A3, respectivamente. 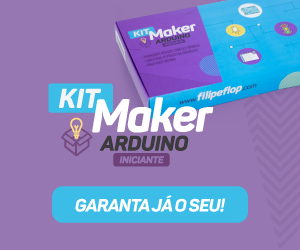 Os pinos Lamp Test e Blanking vão ligados no Vcc, e o pino Latch vai ligado no GND. A alimentação do CD4511 é de 5V. Você pode até usar um display 7 segmentos anodo comum, mas para isso você terá que colocar transistores nos pinos de saída do CD4511. Consulte o datasheet do CI para ver o esquema de ligação. O programa abaixo é um contador que mostra no display 7 segmentos os dígitos de 0 a 9. Observe que usamos simplesmente o estado (HIGH ou LOW) dos pinos 4, 5, 6 e 7 para enviar os dados em binário para o CD4511. O loop mostra os dígitos de 0 a 9 no display, e também envia essa informação para o serial monitor, para fins de acompanhamento. Hello! Is CD4511 able to control 2 7segment displays as Max7219 can do it? If yes, you could to make a tutoral about it. Thanks. You can use two CD4511 to do this job... Each CD4511 can control only one 7 segment display. You just need to insert a transistor in each common terminal of the displays in order to switch separately them, an then, by your code, you need to set a logic that put on the four inputs first one number and after, the other number. Example: suppose that you want to show the number "80" , so you need to first switch on the transistor on the higher display of decimal number and switch off the units display and make all of your outputs in arduino as HIGH, then you will have an "8", so, for the "0" just need to invert transistors switch and lead the outputs to LOW, then you will have an "0". 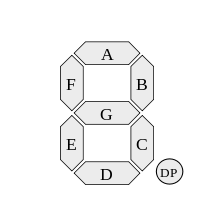 *to make it good, the delay between the switching transistor need to be very small, it makes the visual effect of both displays working at same time, but in fact, it is just switching one after another. Actually it can drive more than two displays... it only depends on your code. Send the number to 4511 and turn on the display1, delayMicroseconds(1) and then turn it off (delayMicroseconds(8)). send the other number to 4511 and turn on the display2, wait a microsecond and then turn off, wait 8 microseconds. I did this kind of PWM with the delays to not use any resistors or diodes in series with the segments.